The Dutch House Garden looked very different in the 1700s. Today's garden has two distinct sections: the Colonial Revival garden behind the house, designed by Homsey Architects in 1952, and the Dutch Kitchen Garden adjacent to the house, designed in 2011. Today some plantings differ from the original mid-20th century plantings in order to keep the gardens visually appealing throughout the growing season and because of costs, environmental changes, and other realities of gardening in the 21st century. The Dutch House Garden is free and open daily from sunrise to sunset. Use your smart phone or tablet to guide you through this tour, or print this page to take with you. Contact us for information on scheduling an in-depth docent-led tour. Start your tour at the back entrance to the historic Dutch House. 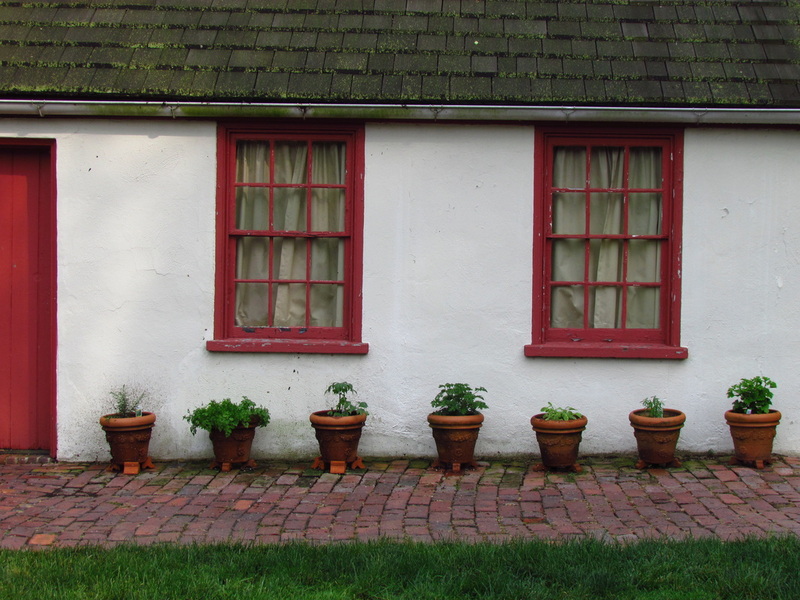 Notice the pots of herbs along the wall of the house, part of the Colonial Revival garden design by Homsey Architects in 1952. The medicinal and culinary uses for herbs made them a popular item in kitchen or back door gardens in America in the 1700s. Walk down the brick path in front of the kitchen door. 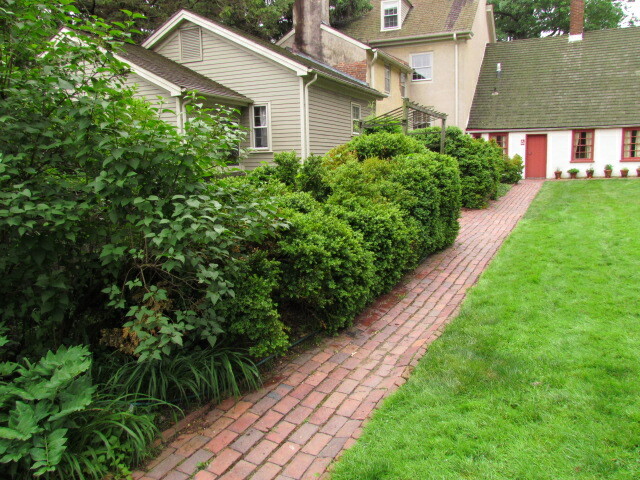 The garden's brick paths were also part of the Homsey design. Near the walkways are large billowy boxwoods that are over 50 years old. Continue down the path to the bench under the pergola. (A pergola is a wooden structure of posts topped with open rafters. An arbor is similar to a pergola but is typically made of lattice work.) Pergolas often support climbing plants, and this one is draped with a fall-blooming clematis. This pergola and bench were another part of the Homsey design. Take a moment to rest on the bench and enjoy the garden before proceeding. Proceed down the brick path to the quaint smokehouse. It was built in 1939, a gift of the National Society of Colonial Dames in the State of Delaware, to provide visual interest and serve as an example of the utilitarian outbuildings that likely stood in the Dutch House yard in the 1700s. 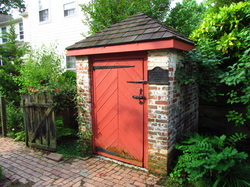 It is now used by Arasapha Garden Club as a tool shed. On the opposite side of the walk from the smokehouse is a charming rose garden. 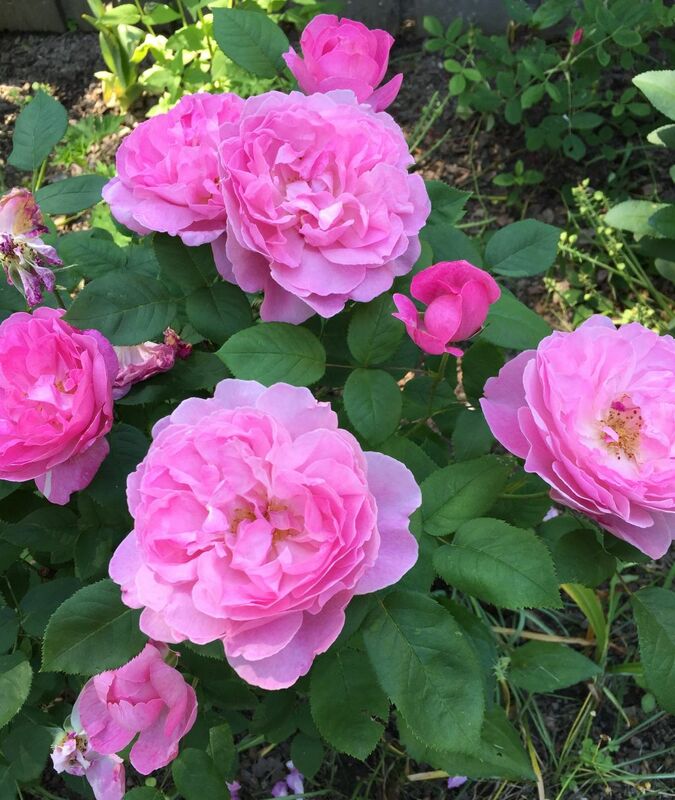 Originally designed as a perennial garden, this space now features 17th century York and Lancaster roses and other English and heirloom roses, with accompanying flowering perennials. At the end of the rose garden is a 'Homestead' elm. Before proceeding , take a moment to sit on the bench near the elm and reflect on how different these grounds looked in the 1700s. Walk to the Dutch Kitchen Garden on the side of the Dutch House. 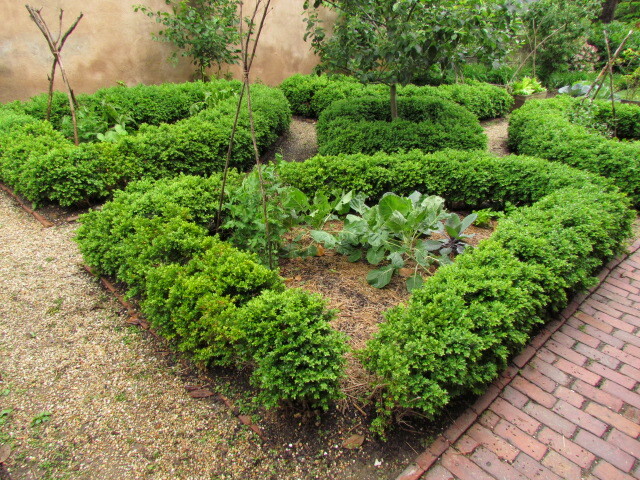 This space was designed by Homsey as a knot garden: a formal garden laid out in a geometric pattern in a square frame, with paths in between plantings. Knot gardens with low boxwood hedges, like this garden, can also be called parterres. Visit the nearby Amstel House Garden to see a parterre garden laid out in the shape of a butterfly. In 2011 the Dutch Kitchen Garden was installed in and around the Homsey knot garden, thereby returning part of the design to its earliest, practical origins. 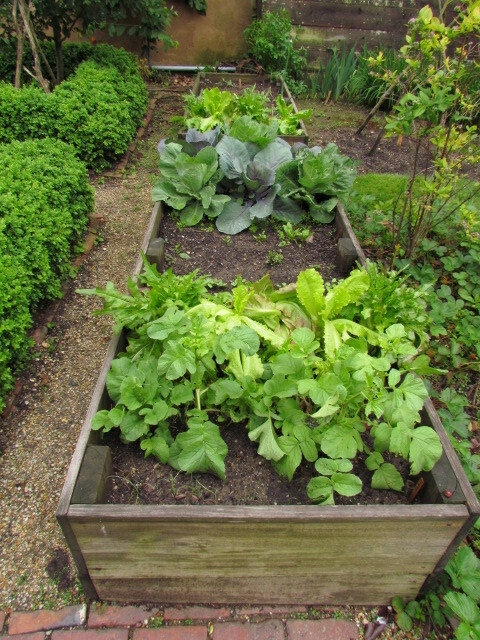 The Dutch Kitchen Garden was inspired by the work of culinary historian Peter G. Rose. The plantings in the knot garden and two adjacent raised beds include a mix of vegetables, fruits, herbs, dwarf trees, and berry shrubs that reflect the culinary history and traditions of Dutch colonists in the mid-Atlantic region. Exit the gardens through the gate to East 3rd Street, or go through the gateway next to the smokehouse to visit the native plant garden maintained by the New Castle Historical Society.